【MULTI-FUNCTIONAL COOKER:】Pressure Cooker, Slow Cooker, Rice Cooker, Steamer,Warmer,Sauté Pan, Yogurt Maker & Stockpot. 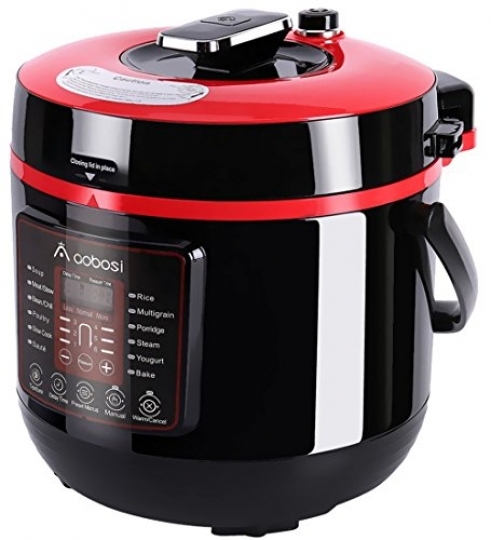 Make your family meals easily with this Aobosi 8 in 1 pressure cooker, greatly reduce stress to cleanup multiple pots and pans after one cooking time. 【SEALED PRSSURE COOKING,KEEP NUTRIENTS.】 Better than Traditional Cookware, retains moisture, nutrients and vitamins. Available to control cooking time and choose tastes, 6 adjustable pressure levels, ensure your food cooked in the best cooking condition. Treat your family or friends with delicious, flavorful and healthier meals. 【EXTRA COOKING ACCESSORIES:】 Including cookbook, soup spoon,extra sealing ring,steam rack.◆ Innovative design with manually setting function ,you can DIY your own delicacy.Give you different and joyful cooking time with this upgraded pressure cooker. This versatile pressure cooker is the ideal cookware in kitchen. 18 built-in programs help you to deal with your breakfast, lunch and dinner with ease.With sealed pressure cooking technology, the electric pressure cooker allows to cook food faster but retain moisture, nutrients and vitamins. Treat your family or friends with delicious, flavorful and healthier meals. With the Aobosi Electric Pressure Cooker, cook delicious meals more efficiently, save time, and have peace of mind as well. The programmable cooker features a manually setting function. Except the dishes on the cookbook, you can DIY your own recipes.Help you to explore culinary journey. •3 Adjustable Textures, 6 pressure level. Warm tips: Online manual and recipes can be downloaded respectively form the “User Manual” and “User Guide”. Thank you for purchasing our electric pressure cooker, which has been made to demanding high quality standards and is guaranteed for a period of 12 months from the date of purchase against manufacturing faults. If your 6qt pressure cooker fails due to a defect in material or workmanship within 12 months, please return it to the place of purchase. 【SAVE TIME & ENERGY.】Cooking with this multi-functional cooker, save your time and energy up to 70%. Free to do other works.The electric pressure prepares the food ready when you serve it. 304 stainless steel cooking pot,no chemical coating,HEALTHY. Efficiently clean up.